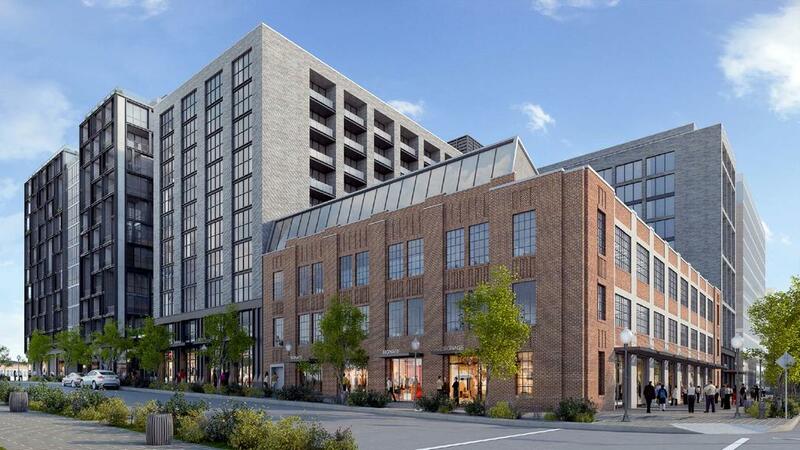 It was less than eight hour’s ago when we reported on Kettler’s proposal to add nearly 1,000 new residential units north of Florida Avenue Northeast, in the Union Market neighborhood. Now comes a Rockville-based developer, less than a quarter of a mile away, with a big mixed-use bid of its own. Foulger-Pratt Development LLC, with joint venture partners Juster Properties and Clear Rock Properties, has submitted plans with the D.C. Zoning Commission to redevelop 301-331 N St. NE, south of Florida Avenue NE in NoMa, with 370 residential units, 175 hotel rooms, office space and ground-floor retail. The historic building in question — historic for its “unique style and representation of the industrial past of the neighborhood — is the self-storage facility, which was constructed in 1931 for National Capital Press. Foulger-Pratt will apply to designate the building as a landmark and repurpose it as ground-floor retail and two floors of office. The overall project will consist of four buildings, including the self-storage facility. The easternmost building, at 331 N St. NE, will be an 11-story, U-shaped residential tower with 275 units and ground-floor retail. At the southwest corner of the site, Foulger-Pratt proposes an 11-story, 175-key hotel. And fronting N Street will be a 94-unit residential building with additional retail. The two residential buildings will share a lobby entered from N Street, and a rooftop pool atop 331 N. Roughly 65 percent of the unit mix will be studios and one-bedrooms, and the remainder two-bedrooms. The buildings generally will include terraces, landscaped rooftop green space and outdoor rooftop recreation space. The phased development — first up, likely, the self-storage property — will also include two large plazas and 250 underground parking spaces in a garage spanning the property. “The Project will create a truly transit-oriented urban mixed-used community that will add new housing, retail, offices, and a hotel to an exciting and transforming neighborhood,” the application states.